Choose this fantastic Orlando hotel- 100% non-smoking and near Walt Disney World, SeaWorld and Universal Studios Theme Parks. 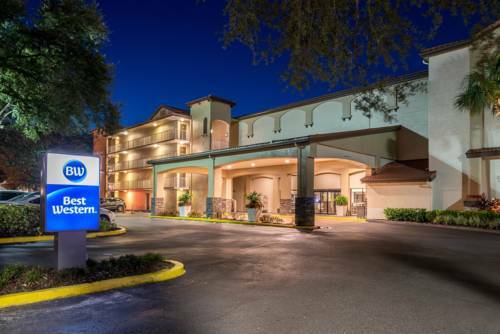 The Best Western International Drive-Orlando is a 100% non-smoking hotel ideally located right on International Drive at the gateway to many key area attractions in central Florida. This Orlando area hotel prides itself on friendly customer service and comfortable accommodations at an affordable rate. Guests staying at this hotel in Orlando will be close to the Orlando International Airport, Walt Disney World, SeaWorld and Universal Studios Theme Parks. Business travelers will be just minutes from the Simcon Training Center, Lockheed Martin, Pepsi Corporation and CHEP. The Orange County Convention Center is located just one mile from the Hotel. This Orlando Florida hotel features new, spaciously-appointed guest rooms, each complete with a microwave, refrigerator, flat screen televisions with cable satellite and wireless high-speed Internet access. Guests will wake each morning to a complimentary Hot breakfast including fresh waffles, fresh pastries and fruit and hot items. Additional amenities at this Florida hotel in Orlando include an outdoor heated swimming pool, fitness center, guest laundry and business services. This accommodation in Orlando also features a complimentary shuttle to all nearby theme parks- Walt Disney World Theme Parks, SeaWorld and Universal Studios . As a proud Disney Official Ticket Location Hotel, you will enjoy the convenience of purchasing your Magic Your Way Disney World tickets right at our resort concierge desk. Our Concierge planners will help you make magic for yourself and the entire family, based specifically on your needs. For a fun-filled stay and convenient location in Orlando stay at the Best Western International Drive-Orlando! Enjoy your stay. 8 mile(s) from Citrus Bowl, Orlando City Soccer,NCAA December Bowls,Concert Venue.